Recently, I found and disclosed CVE-2018–1160. This really old bug in Netatalk allows remote unauthenticated attackers to overwrite some struct data. I leveraged this bug to bypass authentication and gain full control of the AFP volumes. This blog is about finding and exploiting the bug. If that doesn’t sound interesting then you probably won’t like this proof of concept video either. * Copyright © 1990,1993 Regents of The University of Michigan. * All Rights Reserved. See COPYRIGHT. Netatalk isn’t nearly as popular as it used to be. Other network file sharing protocols have eclipsed AFP in popularity (I’m looking at you SMB). However, Netatalk still sees a respectable amount of downloads on Sourceforge, and it has a package in the official repository of a number of Linux distros. I also found Netatalk on a whole lot of routers and NAS. So it’s still chugging along. Netatalk has a mistake that has gone unnoticed, as far as I can tell, since the original import into Sourceforge back in 2000. Do you see it? Probably not. I’ve withheld crucial information. What if I told you that dsi->attn_quantum a 4 byte integer and dsi->commands is attacker controlled? Now do you see it? Look at the memcpy. Two attacker controlled parameters are used to copy data into an integer. An attacker controls the the source (dsi->commands + i + 1) and the size (dsi->commands[i]). Because dsi->commands is a char array the size parameter is limited to a maximum value of 255. Due to the massive black hole located in the data array, we can only overwrite datasize, server_quantum, serverID, clientID, the commands pointer, and partially into data. People always want to know, “How did you find that bug?” They want to hear, “taint analysis.” They sigh when they hear, “intermediate language.” They beg to see the seed corpus. They’re dying to hear about your cutting edge research. I found this bug on a 3 hour flight from Austin to Philadelphia. I was flying home from a meeting and planned poorly. I didn’t have much to do. I had the Netatalk source on my laptop for a NAS project I was hoping to get around to. I just started reading the source at main. How’s that for fancy research? Trust, but verify. I get it. A unique property of this vulnerability is that one of the overwritten variables, server_quantum, gets reflected back to the attacker. Check this out, the following will send a well formed DSI Open Session request to the server. The server response contains a “quantum” value that’s originally defined in a configuration file. 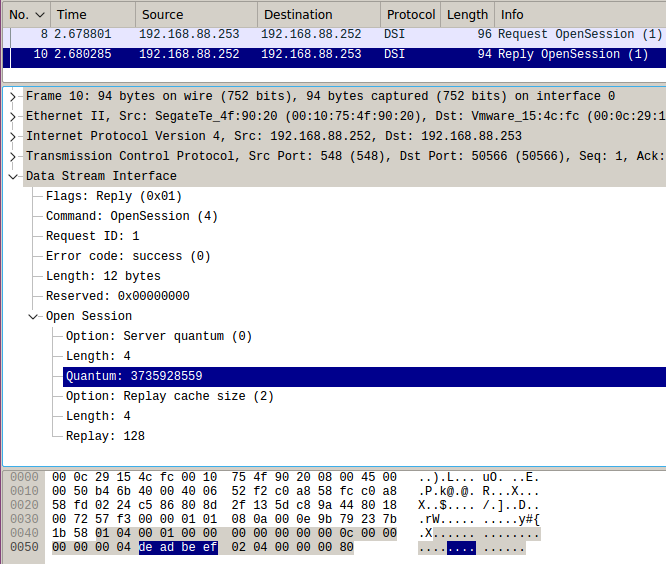 In the Wireshark screenshot, you can see the quantum value is advertised as 0x100000 or 1048576. Let’s overwrite that value. We just update our dsi_opensession payload to provide a length (0x0c) that will write beyond the integer. Now the response shows 0xdeadbeef to be the server’s quantum value. Reflecting an overwritten value is neat and all, but it’s just not useful. We want execution control. We need a path forward. But our options are limited. Of the five variables we can overwrite only commands seems to have any promise. The life of the commands pointer begins shortly after a new connection is forked to its own process. A chunk of heap memory is allocated and assigned to commands when the dsi struct is initialized. 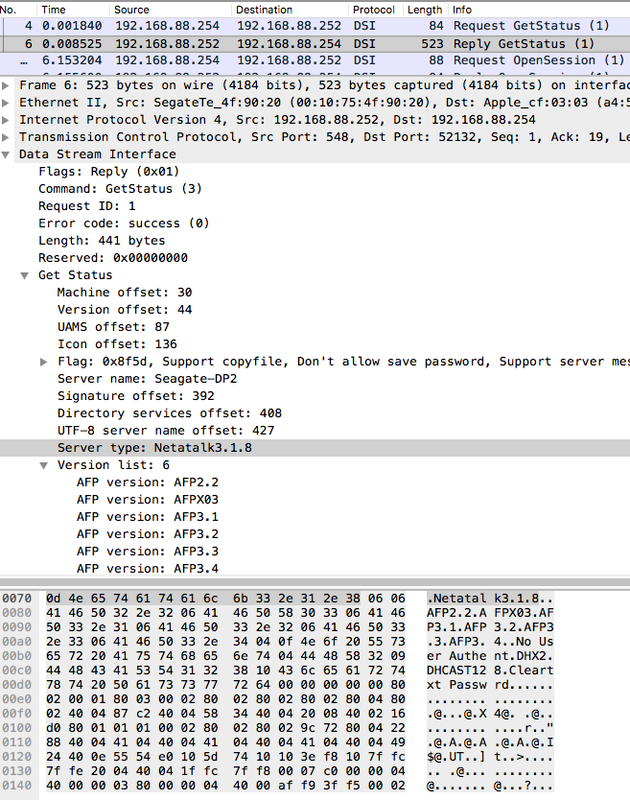 Every incoming AFP message is written into the commands pointer before being processed by Netatalk’s AFP functions. The commands memory isn’t freed from existence until shortly after the connection is terminated and just before the process exits. 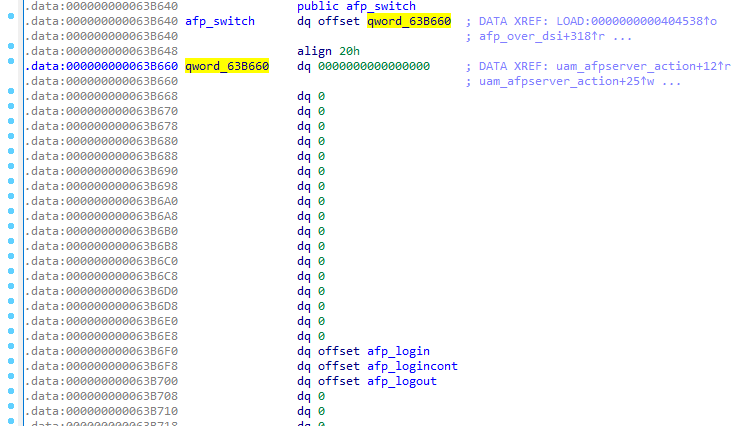 commands passes through the system based on a global jump table pointer defined in etc/afpd/switch.c called afp_switch. afp_switch points to a jump table that contains 255 entries. Each entry is either NULL (not implemented) or a function that processes the AFP data in commands. afp_switch points to one of two versions of the jump table. One is called preauth_switch and it contains the only four functions that unauthenticated users can invoke. preauth_switch is the default afp_switch table. The second jump table is postauth_switch, and it gets swapped into afp_switch after the user has authenticated. Overwrite the commands pointer with the address of our choice. Write to that address using AFP packets. The question becomes, “What address do we write to?” That is indeed a difficult question and one we might not always be able to answer. For example, on Ubuntu, where ASLR is enabled by default, the official Netatalk package has been compiled to be position independent. We don’t know any addresses ahead of time. In that case, we don’t have enough information to move forward. But “when reason fails, the devil helps!” Enter stage right, embedded systems. For the remainder of this blog I’ll be focusing on a specific Seagate NAS. It isn’t that the NAS is a horrific security abomination or anything. Seagate simply made one little oversight: they didn’t compile Netatalk as a position independent executable. That’s all we need. preauth_switch is a mostly empty table of functions. The client decides which preauth_switch function to invoke via the AFP packet. The client doesn’t need to be authenticated to invoke a preauth_switch function. albinolobster@ubuntu:~$ readelf -s afpd.netgear | grep "auth_switch"
albinolobster@ubuntu:~$ readelf -s afpd.seagate | grep "auth_switch"
In the binary I extracted from a Netgear device, you can see that we can easily pull out the preauth_switch address (0x8395c). However, the Seagate binary is stripped so we need to look a scratch deeper. Pop open your favorite disassembler and locate afp_switch. You can see that preauth_switch starts at 0x63b660. What do we write into the preauth_switch? How about a function that requires authentication? We’ll prove that we can control the execution flow and bypass authentication. A good candidate is afp_getsrvrinfo. afp_getsrvinfo is just like DSI GetStatus except over authenticated AFP. We can find afp_getsrvinfo in the sixteenth entry of the postauth_switch. To execute this plan we need to update our script to overwrite the command pointer with the preauth_switch address (0x63b600). Each subsequent AFP request after on the same connection will be written to 0x63b660. As such, we just need to figure out which table index we want to write the address of afp_getsrvrinfo to. We know that the first byte of the AFP message is the command and the command is used to do the table lookup. We can’t write the afp_getsrvrinfo address to table index 0 since the index is partially used up by the command byte. But index 1, starting 8 bytes into the table, is open. If we write the afp_getsrvrinfo address into index 1 then we should be able to invoke it by setting our AFP requests command byte to 1. We haven’t yet learned the afp_getsrvrinfo address though. Let’s remedy that. Finally, we construct the AFP message that will invoke afp_getsvrinfo. The dsi_header portion looks almost exactly as before except we need to update the second byte to indicate the payload is an AFP command. Also, we need to increment the request ID. The afp_command starts with a 1 like we talked about above and then pads until we can write the address for afp_getsvrinfo in the tables second entry. Nothing left to do now but test it! What? Failed to render UTF-8 characters don’t look like success to you? Well, you’re wrong. This is what success looks like. This is exactly what we expect from the afp_getsvrinfo command. We just didn’t implement the parsing. 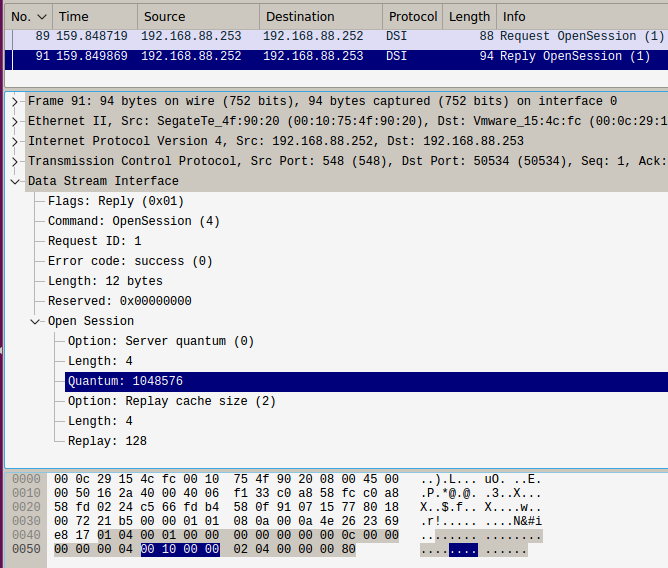 Notice, in the screenshot below, that Wireshark thinks we’re executing the afp_bytelock function (postauth_switch table entry 1). 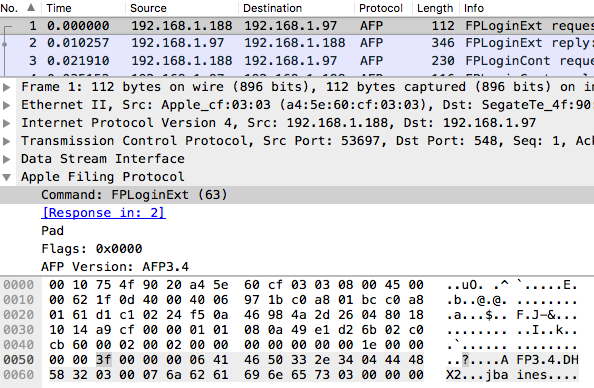 Wireshark also fails to parse the payload because… well, the payload isn’t from afp_bytelock. The full exploit is more complicated than all that. We need to make room for parameter passing and implement AFP message parsing. But that’s all rather tedious. I assure you, it was no fun to code. I’m certain it would be less fun to blog. If you’re interested though, you can find the full exploit on our GitHub. The Netatalk developers released a larger patch to fix this issue, but the most important part is highlighted below. Just a simple length check is all that was needed. I mentioned previously that this memcpy error appears to predate Netatalk’s import into Sourceforge. However, I was trying to exploit a Netatalk 2.2.5 (released in 2013) on a Netgear router and it wasn’t working. It turns out that the DSI struct was altered in Netatalk 3.0.1 (released in 2012) but not backported to 2.x. The change allows us to overwrite the commands pointer. Isn’t git blame just wonderful?